Does it seem like any time your puppy has an accident in your home, it just so happens to be on your area rug? Even after cleaning and treating the spot yourself, your puppy just seems to keep going back to that rug. Why do they do this!? I’m Ruthie with Arizona Oriental & Specialty Rug Care here in Prescott and hopefully I can shed a little light on that question for you. First, your dog could be marking his territory. Unfortunately for their humans, dogs have always been very territorial. Not only that, but their noses are thousands of times more sensitive than our own! If they smell another animal in their home, they will mark their territory. Your dog picks up on the lingering sheep smell still in wool, igniting that territorial instinct. Some Persian and Asian weavers even use goat or camel hair in the rugs, making it smell even more like an unfamiliar animal. Second, your dog could be smelling his past accident. Even if you have cleaned up the previous urine accident yourself, you most likely won’t be able to remove the urine that soaked deep into the fibers and knots of your rug. When urine dries, it turns into sticky urine salt crystals that stick to the fibers of your rug – kind of like that lollipop your kid dropped on your carpet and forgot about. These salt crystals are hard to get rid of without a thorough urine treatment. This means that your dog, with his super sensitive sniffer, will continue to smell the urine in the rug and go back to peeing in the same area. Third, your rug (especially if it’s wool) is a very absorbent surface. Maybe somewhere in your dog’s mind, he figures that peeing on your nice rug will be better for him because there won’t be any splash back onto his paws when he pees there. He gets to relieve himself and his paws stay nice and urine free! Not only does urine contaminate your rug and attract yucky bacteria you don’t want anywhere in your home, but those urine salt crystals are also very destructive to rug fibers. If left unattended, urine can cause dry rot to your rug’s fibers, weakening them and leading to cuts, tears, and separation of the fibers entirely. 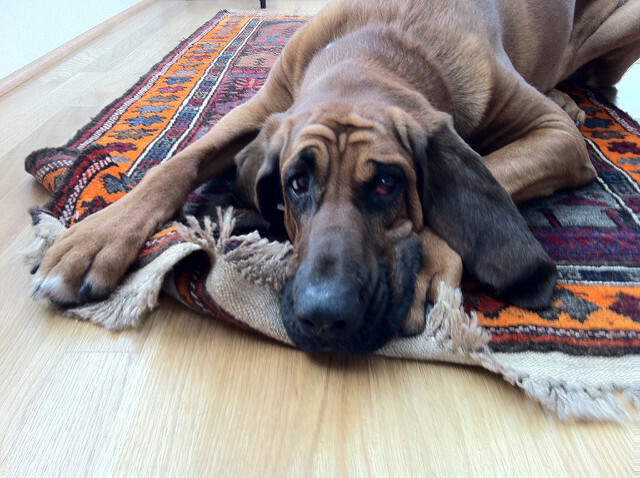 Don’t wait until your rug is permanently damaged by your dog’s accidents! Bring it in to us at Arizona Oriental and have us thoroughly treat your rug for pet accidents! Arizona Oriental & Specialty Rug Care serves Sedona, Prescott, Prescott Valley, Flagstaff, and much of the Northern Arizona areas. We meet the highest standards in professional area rug cleaning with rug wash specialists having earned the highest training, including certification as WOOLSAFE FIBRE CARE SPECIALISTS through the WOOLSAFE ORGANISATION. Such extraordinary certification ensures our clients’ area rugs receive the utmost in care.